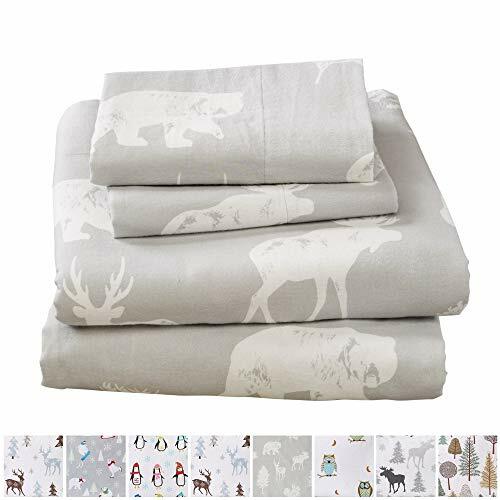 These luxury cotton flannel sheets are so warm, soft, cozy and comfortable, they'll become your new favorite winter sheet set! Use them anywhere: bedrooms, guest rooms, vacation homes, dorm rooms, RVs, even for camping. Stay warm on the coldest nights and get a good night's sleep! The fun patterns are perfect for kids and teenagers. Deep pockets fit mattresses up to 17 inches deep. Machine washable and long lasting. Fade, stain, shrink, wrinkle and pill resistant. SUPER SOFT LIGHTWEIGHT WARMTH: Feel the difference in our 100% TURKISH COTTON FLANNEL. These are the BEST WINTER SHEETS you'll ever own! They're SOFT, COZY, LIGHTWEIGHT, WARM, GENTLE and BREATHABLE. Stay warm and toasty on the coldest nights and sleep better than ever. Available in a variety of PRINTED PATTERNS for you to choose from. Great for the kids!